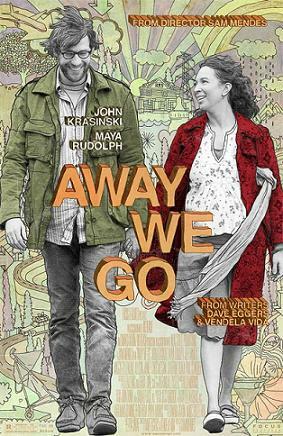 Sam and I recently rewatched Away We Go, the movie starring Maya Rudolph and John Krasinski, directed by Sam Mendes, and written by the husband-and-wife team of Dave Eggers and Vendela Vida. Since it's a film about pregnancy and wondering about the future, we thought now (at seven months along with my third) was the perfect time to give it another view. Verona (Rudolph) and Burt (Krasinski) are six months along in expecting their first child. They're in their thirties and living somewhere sort of ramshackle, with a cardboard window and woodworking tools in the bedroom, so they decide to hit the road to visit friends and family members to decide where they want to settle and raise their daughter. It's a mellow, funny, offbeat sort of movie, and I really dig the main characters and the journey they make, both physical and metaphorical. However, when it first came out in 2009, the controversy among the crunchy crowd was due to the satirical scene of one household they visit, a self-described "continuum family." 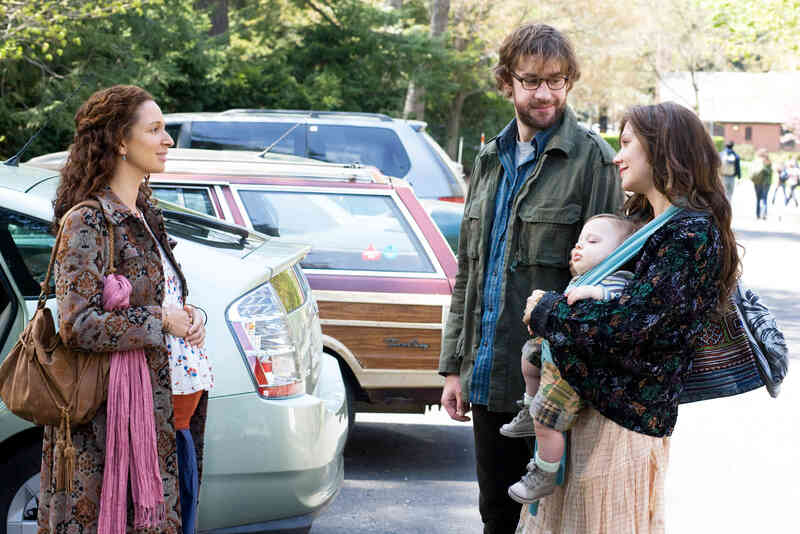 The mother, L.N., played by Maggie Gyllenhaal, is tandem breastfeeding her baby and four(? )-year-old when the two protagonists walk into her office. She and her husband have a great big family bed (I was kind of jealous), and they practice the "three Ss": no separation, no sugar, and no strollers. It's obviously a comical jab at attachment parenting as well as general hippie types of childrearing, including that espoused by followers of The Continuum Concept. The separation idea is expressed in the breastfeeding and family sleep, and the no-sugar idea is left alone, but the no-strollers rule gets big play when Verona and Burt mistakenly think L.N. wants a stroller but just doesn't have one, so they buy her a fancy model. L.N. is so horrified she can't even speak for a moment as she shoos it back out of the house, and when the evening devolves into a huge confrontation between her husband and Burt, Burt and Verona leave, but not before offering the older son a ride in the forbidden stroller — which he eagerly accepts because: Whee! Strollers! My thoughts about the section, both times I watched it, were mixed. I wasn't so offended that it threw me off the rest of the movie (as you can tell), but I did have this feeling that it was mean-spirited. Now, the family they've visited just before this one was awful, in an over-the-top comic way, and Burt's parents, visited at the beginning of the movie who give the push for this trip (they're moving to Belgium for the first two years of their grandchild's life), were also played up as outlandish. So in that respect, the pretentious L.N. and her hippie brood fit right in. But then the families they visit afterward are played as much more subdued and realistic, so I at least had a wish the film could have portrayed a radical parenting style with a more even hand, even if Burt and Verona decide it's not for them. Because, on the feeling-offended side, I thought, I'm not friends with anyone who's that confrontational and judgmental and "out there" when it comes to continuum parenting. I know such people exist, but I didn't find this to be a fair representation of what attachment or continuum or crunchy parenting usually looks like. Later on, Verona and Burt visit an interracial family with several adopted children, with a sort of Pitt-Jolie vibe going on and a general attitude of funky tolerance. It's exaggerated in that most families don't actually look that way, but it's presented as a beautiful and viable way to raise a family. It would have been nice to see continuum parenting presented with that kind of respect. When your way of parenting is already the minority, it stings to have it represented as buffoonery and feel even more marginalized. I think of all the people who saw the ideas of babywearing, extended breastfeeding, and cosleeping for the first time in this movie and were just as gobsmacked as the main characters, and the movie just encourages them to deride rather than consider them seriously. On the not-so-offended side, though, I have to admit: The stroller thing was funny. I have heard babywearing zealots express just that much horror over strollers (as L.N. puts it: "I LOVE my babies. Why would I want to PUSH them away from me? "), and it just made me chuckle to see the kid happily accept a ride in one for the fun of it. My kids have been the same: They loved being worn, but they thought a stroller was good times, too. I am obviously a huge proponent of babywearing (done safely & comfortably), particularly for the early months, but I'm not part of the anti-stroller brigade. It's also fun to see your obscure brand of parenting mentioned at all in a movie, even if it's to have it mocked. At least someone noticed us! There's no such thing as bad publicity, maybe? Plus, there is something cathartic about having the judgy parts of continuum parenting shown up for what they are. Certainly I've been guilty of being judgy myself, so it's a nice reminder to tone it down a notch, and I've heard plenty of other people, on forums and Facebook and real life, express views in just the same obstinate, unempathetic, and infuriating way that L.N. does. And, as I said, this scene comes just behind two other scenes of over-the-top parenting fails, so it's intended as comedy. Ok, enough said about it. I've written a lot for what's a relatively brief portion of the movie, but I wanted to let you know what to expect in case that sort of thing would turn you off the film as a whole. There are a lot of laughs that aren't at anyone's expense and just feel honest and real: for instance, the fact that Verona's only six months along but runs into a stranger who says she's clearly due any day now (Who hasn't had that experience in pregnancy?!) and is even forced onto a train ride when airline staff decide she's clearly too far advanced to fly. 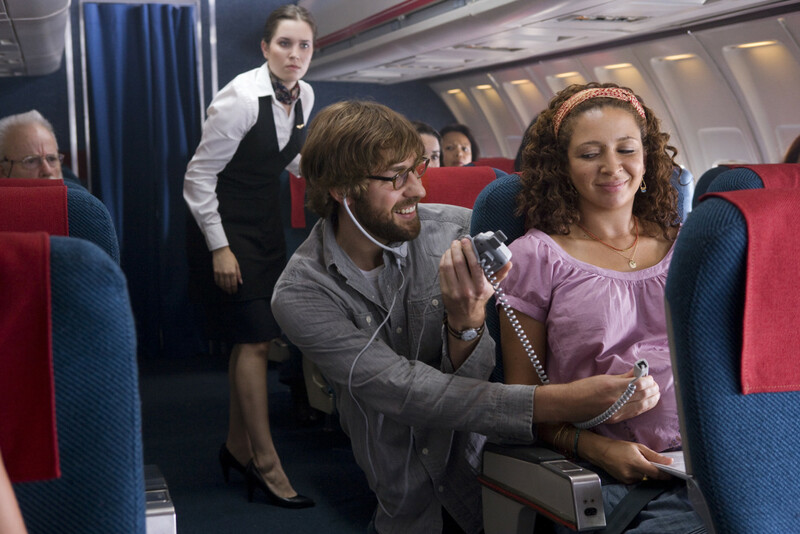 There's a running gag that Verona wants the baby's heart beating faster than it is (she checks with a handheld doppler), combined with her comments that laid-back Burt never actually gets angry or yells — from then on, Burt keeps jumping out and screaming randomly at her, then checking with the doppler to see if it helped. I also love the soundtrack, and the songs are still playing through my head. The rest of the movie is touching and tender, with many moments that will make you sad but in a good way, and just as many moments that make you happy that love and family and togetherness and hope exist. The sadness comes with talking of the death of parents, of miscarriage and infertility, and the fact that some parents just can't handle the gig. As one of the (good) parents they meet puts it, "You have to be so much better than you ever thought." In the end, you know that Burt and Verona don't have it all figured out, and that's ok. You know their lives will change immeasurably when they have their kid, and they won't do everything right or as they planned, but they will do just fine. They will love her, and each other, and that blossoming of a new life and a new family will be beautiful. Maybe it's because I'm pregnant, but I cried. Good tears. Have you seen Away We Go? What did you think? on their French fries [in Montreal]? 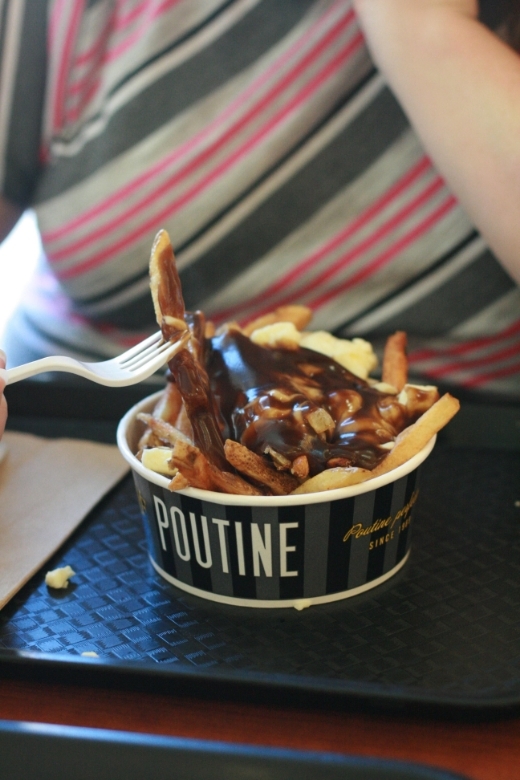 eating poutine in British Columbia. okay, how the heck have I missed the fact that you're pregnant again!!? we did have a stroller, though she didn't use it much. She was mostly independently mobile, if attached by hand or other clingy part. again, yay, for new baby! @Tree Peters: Thanks for the congrats, Tree! We're very excited. We mostly used our stroller as Mikko got into preschool-hood and still didn't want to walk, lol. Alrik's been much more inclined to self-propel! I laughed until I cried at the "I love my babies WHY would I want to PUSH them away from me?!" Our first was super colicky, so the overdramatization of everything I had tried to do to relive his misery was just funny in that format. And now, I want to see the movie again! Wordless Wednesday: Happy 3rd & 7th!